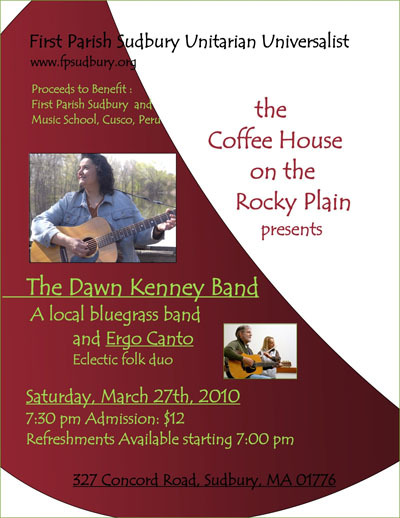 Featured performers March 27th are The Dawn Kenney Band and Ergo Canto. Something new is perking in our historical town center. Inspired by what the colonial settlers named the location of the 1797 meetinghouse of First Parish Sudbury — the rocky plain refers to the glacial landscape that none of the original settlers wanted to farm thus the religious society got it by default. On Saturday, March 27th, at 7:00 pm, ‘The Coffee House on the Rocky Plain’ premieres its first coffee house showcasing two outstanding local musical groups. The evening’s proceeds benefit the Instituto Superior de Musica Publico Leandro Alvina Miranda in Cusco, Peru to purchase instruments and supplies and First Parish Sudbury Unitarian Universalist. Tickets and refreshments will be available at 7 pm. General admission is $12. Refreshments include savories and sweets. Performance begins at 7:30 pm. Join us for an evening of really good live music in our historic meetinghouse.